We cannot deny that Sen. Richard Gordon has done monumental things in developing Philippine tourism. His “Wow,Philippines!” and the miracle that is the Subic Bay Metropolitan Authority will forever be his legacy. 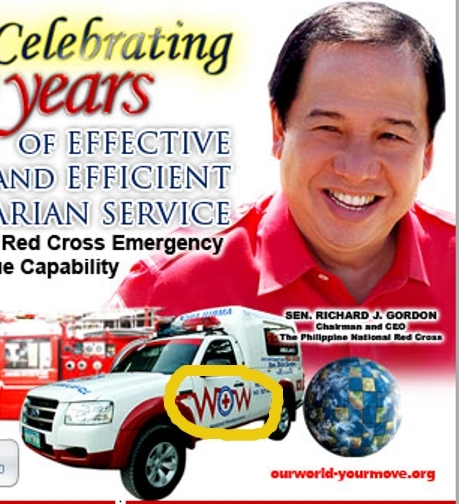 Extending the “Wow!” campaign for cheap mileage by subtly putting it on Red Cross vehicles, though, makes Gordon just about as petty as your basic Barangay Captain who puts his name on Barangay patrol multi-cabs and tricycles that don’t belong to him. It isn’t so much that the Red Cross cares, the hidden political ad suggests, but because calamities are incredibly exciting.